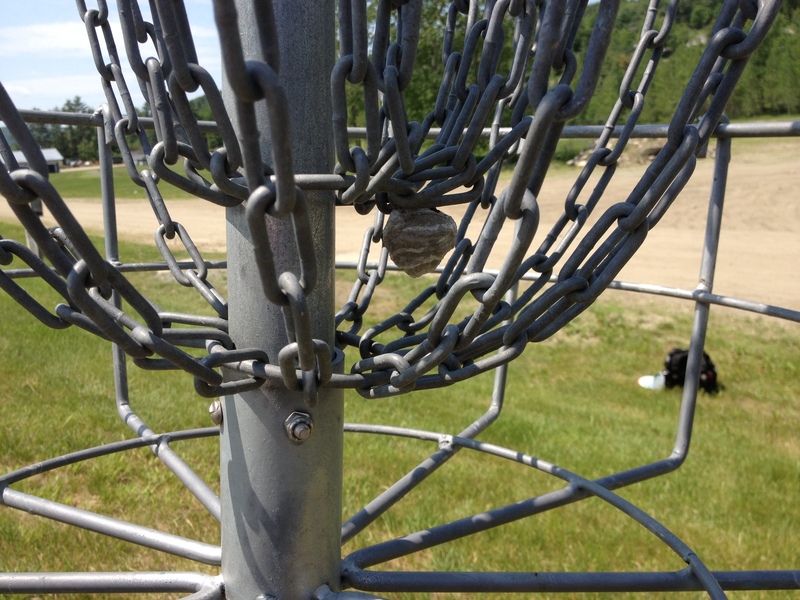 Basket 15 at Oxbow DG Course has a hornet’s nest hanging from the chains… HOW IS THIS POSSIBLE? unless nobody plays here??? 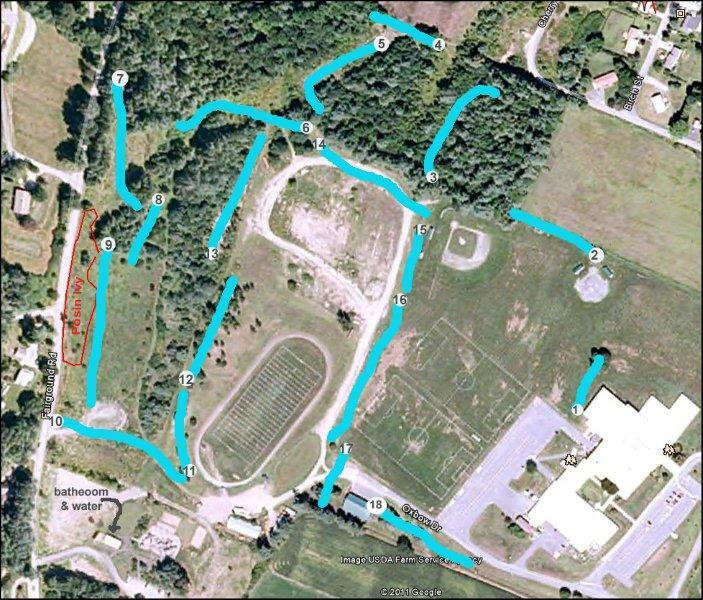 Up in Bradford, VT there’s a disc golf course located at the local high school. I spent a long weekend at a campground near this course and had a chance to check it out. There wasn’t a lot of info on the web about the course beyond the DGCourseReview.com write up, so I really didn’t know what to expect. Knowing ahead of time that the course was located at a high school, I kept my expectations low. I assumed there would be a lot of holes in the wide open, and a lot of holes with no tee-pads. This was partially true, but the course ended up far exceeding my expectations! Hole 2- not 300 ft, straight & open- PAR 4? First off, the marked “par” numbers on each of the signs are a bit of a joke. OK, they’re a total joke. If you used a full sized ‘lid,’ they may actually be accurate. However, I threw a 54 over 18 holes, and according to their suggested pars, I was actually -12 down! Boom! There was one hole marked as a par 5, and I hit the basket on my second throw… in my opinion, that shouldn’t even be POSSIBLE on a par 5. Hole 2 at Oxbow- under 300 feet, straight, and open- PAR 4??? So par numbers aside, the course really starts to get fun after hole 5. The first few holes (and some of the last few) suffer from the predicable “high school course” problems. They aren’t as creative since they’re limited in design, they’re short, and the tee-pads aren’t much to speak of. However, after a hole or two in the woods, you start to go up a huge hill. The first uphill shot is hole 6, and is like stepping on to a new course. It’s a steep incline, so getting to the green is a real challenge. Actually just hiking up to the green after an upshot get’s you winded (unless you’re in hiking shape!) and the putting is understandably harder. Hole 7 at Oxbow DG Course- one of my favorites. Such a great fairway, the basket is tucked up the hill near the yellow support cable. The following holes of 7, 8, and 9 are the highlights of the course and had me immediately wishing I could come back (I couldn’t- too busy!) and play another round. Hole 7 is more or less level from tee to basket, but the middle 300+ feet are anything but. It’s a bit of a valley, with long grass- a true disc golf fairway if there ever was one. 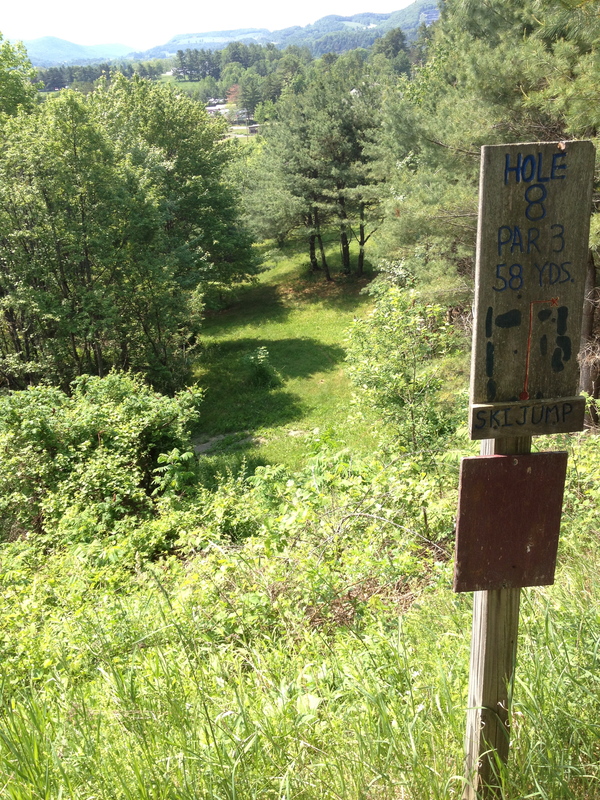 Hole 8 plays from the top of a steep embankment and can barely hold a tee-pad, let alone a group of 4 disc golfers! I threw a safe shot/tomahawk on this hole so I wouldn’t have to go searching for a disc, but I would have rather thrown a perfectly straight putter and tried for the birdie. On hole 9, the sign says 155 yards (465 feet) and Par 5. It’s a wide open field shot bordered by the road on the right- with the whole fairway and field slanting down to your left as you look at the basket. This added a little distance to my drive(s), (I threw 4-5 shots here… couldn’t resist) but also carried them further down the hill away from the target. It was kind of a toss-up for me if I enjoyed hole 7 or hole 9 more. Hole 10 is a really fun one as well, but at the moment there is a giant pile of shale or something construction related stacked in the way- so there isn’t a true tee-pad anywhere. This gives you a good idea of the flow of the course- a great little map. The rest of the course has some more interesting shots, but nothing to rave about. They would definitely keep me from being bored if I played there on a regular basis, and there isn’t anything to complain about! Some holes go along embankments, some are tucked into trees, and others are longer and wide-open. The signs, despite the bizarre par numbers, are very helpful. I found each tee and basket fairly quick and navigating around the course was logical. Parking is easy, since it’s a high school. It obviously limits the course’s use during school hours, but it’s a public course and is a small price to pay for some of those holes and their spectacular layout in the middle portion of the course. The majority of the tee-pads were dirt, but they were in good condition with no divots. It must not get heavy use because the local course that I play with dirt tee-pads is frustratingly divot filled. There are a couple/few holes towards the end that have cement squares (3′ x 3′) for tee-pads. I found them a little tricky to time my run-up on, but they will surely last a long time. The baskets are all in great condition. Some of them are single chain Innova baskets, but did not spit my disc out in any surprising ways. In terms of being righty-lefty friendly, I’d say it has more of a right handed tilt, but I wasn’t throwing all hyzers either. The shape of each hole varies nicely, if anything the course is biased towards tunnel or straight shots. 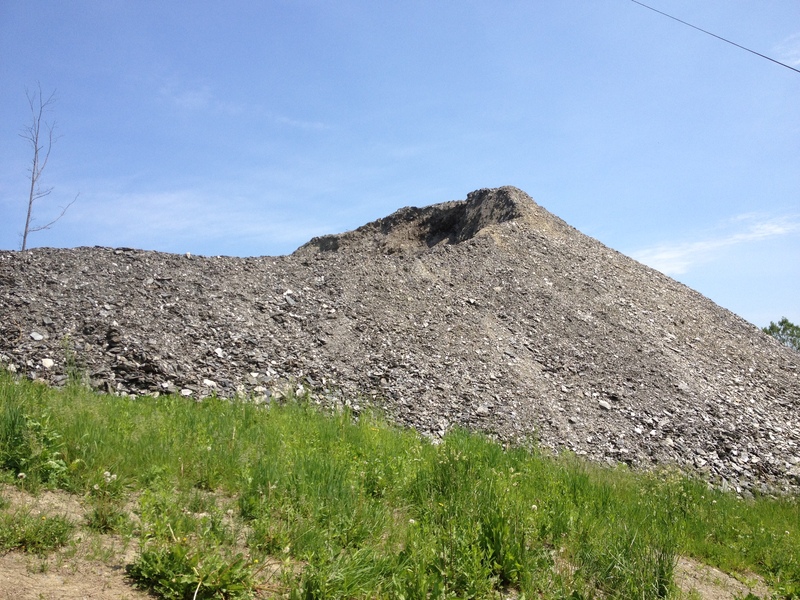 The giant pile of shale or whatever this was- blocking hole 10. That’s it really. Personally, I’m keeping the address of this one saved on my phone (it’s: Oxbow High School at 36 Oxbow Dr. Bradford, VT 05033) and if I take any DG road-trips through or near that area I will definitely play it again. 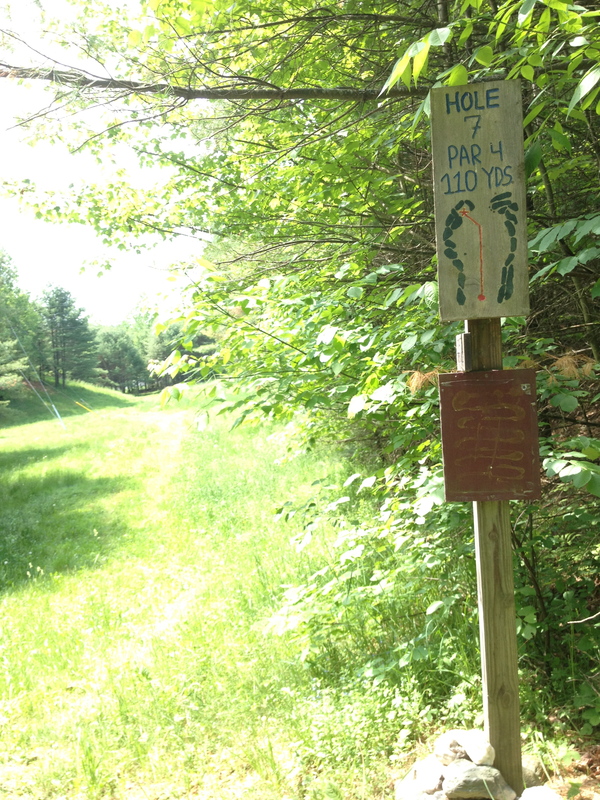 I won’t be making the trip from Boston to Bradford, VT for only this course, but since it was such a fast round, with those 5-6 great holes, it’s not a huge commitment. Give this one a shot people! Vermont is a beautiful state, and this course showcases it in a FAIRLEE obvious way (terrible VT pun…)! 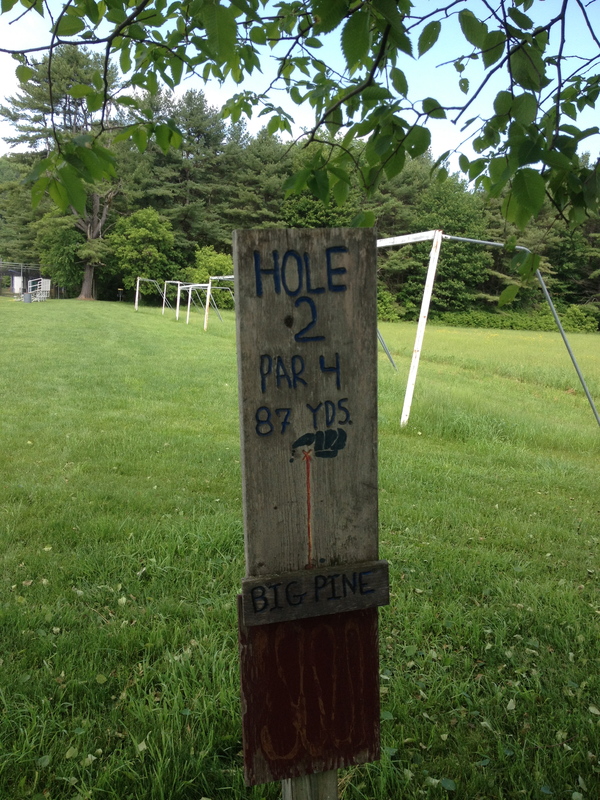 This entry was posted in Course Highlights and tagged bradfor, course, disc, golf, oxbow, review, vermont, vt. Bookmark the permalink.